This timely book by Jerome A. Cohen, whose groundbreaking work in the 1960s laid a foundation for the expanding field of Chinese law, and Margaret K. Lewis, professor at Seton Hall University School of Law and an expert on Taiwanese and Chinese law, will be valuable to lawyers, judges, and criminal justice professionals, as well as to anyone interested in legal reform and in the development of criminal justice systems. The Chinese leadership has for years claimed that it would soon abolish the infamous labor camps for its police-dominated system of "re-education through labor" (RETL) but so far has not taken steps to do so. Although the country's new leadership has signaled that it may finally reform, or perhaps even eliminate, RETL, it is still a reality in China. Having abolished its own similar system of labor camps for liumang--very loosely translated as "hooliganism"--in 2009, Taiwan's success in curbing arbitrary police power stands as a challenge to its neighbor across the strait to outlaw, at last, its analogous system. Taiwan's success in curbing arbitrary police power stands as a challenge to China to follow through on years of false starts on reining in the most egregious exercises of unfettered police power. 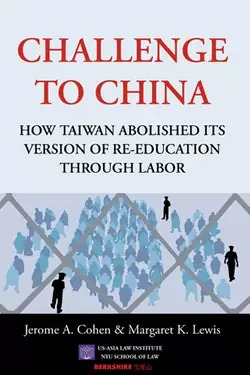 In this important book, Professors Cohen and Lewis, leading China scholars of different generations, have drawn on the repeal of the Liumang [hooliganism] Act in 2009, as well as Taiwan's broader achievements in legal reform, to call upon China, under its new leadership, to learn from Taiwan's experience. Challenge to China is not only a scholarly tour-de-force; it is a beacon for the reform that is essential if the citizens of the People's Republic are to receive the rights they deserve and their government is to command the respect that is due a great power. Taiwan has successfully made the transition from authoritarianism to democratic governance and correspondingly from a police-centric to a court-centric legal system. Through a meticulous case study of the abolition of the offense of liumang [hooliganism], Challenge to Chinaprovides a fresh and insightful perspective on the rise and fall of that notorious penal institution in Taiwan and the interaction between political liberalization and police accountability. . . . Taiwan's experience says to China that a robust legal reform not only strengthens democracy, it may also catalyze it. Elections alone do not make a democracy. To be fully democratic, states must give up the convenience of arbitrary power and place themselves under the law. In this gem of a book, Jerome Cohen and Margaret Lewis show how the Taiwanese state did just that. Whether ransoming racing pigeons or 'eating the same fish twice,' the authors weave together legal detail with juicy interview data and charming case studies to create a narrative that is persuasive, informative, and engaging. This short, readable book explains Taiwan's legal system, details its legal reforms, and offers guidance (and hope) to reformers everywhere--including those in the People's Republic of China--who are working to rein in police power and secure the rule of law.